Born in Belfast, Northern Ireland, Linda McGeady has been a Portland resident since 1997. Linda has a long-standing passion for the arts dating back to her youth in Northern Ireland and Scotland, her studies in Paris, and eight years working in London. She began collecting artwork as a penniless student and later organized exhibitions for artist friends in Scotland and London. She joined the board of the Portland Institute for Contemporary Art (PICA) in 1997, leaving in 2003 after the birth of her daughter. Through the McGeady Family Foundation, Linda is a strong supporter of arts organizations including the Pacific Northwest College of Art (PNCA) and the Portland Art Museum. 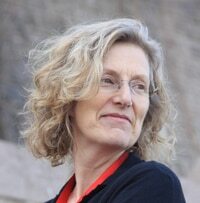 Prior to moving to the United States, Linda McGeady was Deputy Director of the Association for the Conservation of Energy (ACE), a lobbyist to the UK and European Parliaments on energy conservation. She holds a Master of Arts degree in French Literature (1st Class Hons) from St. Andrews University in Scotland, and was a graduate student at St. John’s College, Oxford 1981-84. Linda McGeady serves on the Art Committee of the Randall Children’s Hospital at Legacy Emanuel, and on the Board of the Circus Project. She is an ambassador for The International School and a member of the 99 Girlfriends giving community, and she supports the social justice work of Partnership for Safety and Justice, Forward Together and Basic Rights Oregon. She is the proud mother of two first-generation oregonians.